Do you make these five copywriting mistakes? But not all micro businesses invest in a professional copywriter to get them. Promoting your business is not just about looking good. Once customers peer past the pretty pictures and glitzy graphics your words need to convince. So if your advertising is not professionally written, you could be missing out on sales. That’s because a professional copywriter knows how to get your words read. So are you ready to discover if you’re making those copywriting mistakes? Then take this 5-minute test. It’s easy to do. 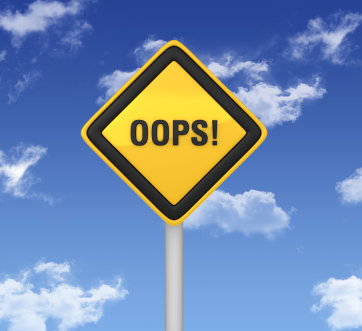 Simply read a piece of your advertising and look out for these top five mistakes. If you didn’t make them great. Your copy is probably getting results. If you did then perhaps it’s time to consider investing in some professional copy. 1. Use “we” more than “you”. “You” is the most powerful word in advertising. Use it in copious amounts and your customer will feel you’re talking directly to them. However many businesses talk from their perspective. They rely on the word “we”. The result? Customers tire, tune out and look elsewhere. Fix it: A professional will re-word your copy and shift the emphasis firmly to the “you” camp. 2. Focus on features – not benefits. Although interesting to you, very few customers care about the chemical composition of your new perfume. But they will be interested to know the scent lasts all day, it makes you smell amazing and you’ll feel more attractive wearing it. With so much competition, you must demonstrate how your business adds value. So focus on benefits and tone down the features. Fix it now: A copywriting pro will stand in your customer’s shoes, pinpoint benefits, and write copy to evoke emotion and get customers reaching for their wallet. 3. Forgot to ask for the sale. It’s not unusual for businesses to forget to tell readers what to do next. If you want people to act, tell them. Use words like “sign up here”, “download this report”, “buy now” etc. Customers are busy, they won’t think it rude you asked. Instead they’ll be pleased you guided them clearly to the next step. Fix it now: A copywriter will craft a compelling call to action that increases your response rate. The headline is the most important words you’ll write. Nail it and you’ll have customers reading on. Screw it up and readers will move elsewhere making the quality and content of the rest of your message irrelevant. Fix it now: A pro will pick the best benefit for your headline and structure it to catch your customer’s curiosity. 5. Advertising that’s difficult to read. How often do you see long paragraphs, endless chunks of text and long-winded complicated language? Advertising works best when it’s conversational in tone and easy to navigate. If it’s not your message won’t get through. Fix it now: A copywriter will break down your message and have customers grasping your content with ease. So that’s five common copywriting mistakes. Which ones did you find in your copy? Let me know by leaving a comment below. And if you’re ready to find out more about Gem Writing simply click here. This is the first instalment in a series of posts called Hire a Freelance Copywriter and Get Rid of Ineffective Sales Copy Once and For All.